Kemberly Richardson has the latest on suspect who sucker punched and robbed a 63- year- old man. FORDHAM HEIGHTS, Bronx -- New video shows a violent robbery in the Bronx that left the victim unconscious. Police say the suspect sucker punched the 63-year-old man in the head, knocking him out, before stealing $40 out of his pockets. 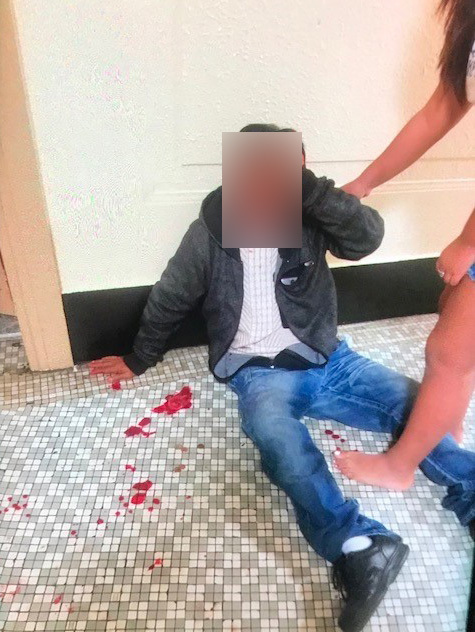 It happened Friday around 8 p.m. in Fordham Heights, with the victim found beaten and bloodied by his 18-year-old daughter lying on the floor inside the building. Police say the suspect followed the man, who speaks Spanish and didn't want to be identified, into his building before punching him. "Once he reached the second door, they poured something in his face and he couldn't see," a translator said. "So he doesn't know where they came from." The victim, a married father of four, suffered a concussion and fractured eye socked. The suspect stole $40 in cash and a bag of groceries. "He felt like he was dead," the translator said. "He didn't know who woke him up, nothing." The suspect is described as a black man, approximately 5-foot-9 and 250 pounds. He was last seen wearing a gray sweater with a blue stripe in the front, matching sweatpants, white sneakers, and a blue hat. He was also was carrying a red bag. "He is just grateful he wasn't carrying a gun or some kind of weapon that could have hurt him," the translator said. "He would love to say something to this man, but he wouldn't say it on TV."